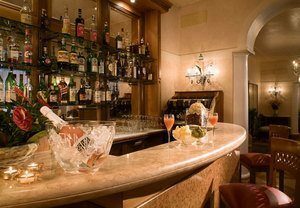 Hotel Bonvecchiati is a stunning traditional Venetian hotel which has offered great services in an authentic and luxurious environment since 1790. Its unique location and charming rooms make it a very agreeable place to stay for a romantic weekend or an unforgettable vacation. 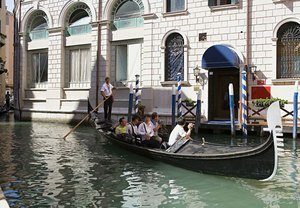 This 4* hotel is ideally located in the heart of Venice. Saint Mark’s Square and its iconic Basilica are only three minutes away. There, you will find the breath-taking Ducal Palace as well as several museums holding testimony to the great Italian culture. A five minute walk will take you to the Rialto Bridge, where vaporetti boats will allow you to discover the beauty of Venice from the Grand Canal- an unforgettable and magical experience! The Hotel Bonvecchiati offers high quality services including the famous restaurant, “La Terrazza” where you will be able to taste traditional Venetian dishes as well as authentic Italian food. The view of the canal will add a romantic touch to your meals. The front desk is open 24 hours. International newspapers and internet connection are available in the elegant lobby. To relax at the end of a busy day, you can visit the wellness centre to enjoy the fitness room, the Turkish bath, the sauna, or the Jacuzzi, or simply enjoy the aperitivo at the bar of the hotel. 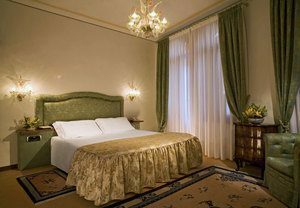 Balancing history with a modern touch, the hotel Bonvecchiati proposes 124 rooms decorated in a classic Venetian style. Named after gemstones, the rooms are comfortable and elegant with luxury en-suite bathrooms. Room grades include standard rooms, Sapphire, 15/20 m2; Superior Ruby, 18/25 m2; Deluxe Diamond, 20/28 m2; and Residenza Room, a spacious 25/30 m2 room located in an adjoining building. Lovely views across the picturesque rooftops and chimneys of the city, its quaint streets, romantic canals and courtyards add to the charm of the rooms.